Military Artist Todd Krasovetz proudly presents the military art original painting and print series titled ‘Wings Of Hope’.“Wings OF Hope” is the name of the first original oil painting in a series of military art paintings commissioned by the Marine Corps and the Command at the Naval Hospital Camp Pendleton, CA. At present there are a total of 4 paintings that now hang on permanent display at various Marine and Navy bases throughout the US but most can be found in southern California Local artist Todd Krasovetz has completed many commissions for military facilities in the San Diego area to honor military service with contemporary paintings. Military Artist Todd Krasovetz specializes as a military Artist Fine Art Paintings Showing Bravery for the Army, Navy, Air Force and Marine Corps throughout the US since 2005.The originals are displayed at locations where you can appreciate good illustrations of contemporary military art. These include the Marine Corps Recruiting Depot, Naval Hospital at Camp Pendleton, Naval Hospital at Pershing Field, and William Beaumont Army Medical Center. Krasovetz is an artist with a mission. “I want to capture the importance of actual service and what it provides to the people who are not in the military — their freedom,” he explains. I try to capture the spirit of brotherhood and camaraderie. Krasovetz approach to presenting this vision follows the tradition of great classical artists like Michelangelo and Raphael. He selects models with real military service to portray scenes that capture the image he wants to portray. He then uses sketches of the different scenes to finalize the composition for a themed painting. If you are in the right place at the right time, you may see this in the San Diego area. Krasovetz has another project on the drawing boards — a sculpture honoring military service. He also paints individual military portraits in his artists studio in Mission Beach. Krasovetz recommends viewing a ‘Wings Of Hope’ documentary for which he was interviewed in September 2009. Military art has a long tradition which you can also view in San Diego year round. One of the best collections is at the San Diego Air and Space Museum. “Hidden Wings ” by Artist Todd Krasovetz 2005 Commissioned by the Command at the Filed Medical Battalion Corpsman Headquarters at Camp Pendleton, CA size 6 ‘ H x 7’ 1/2 w feet. These art paintings have become very popular within both the military, there families and the general population. In July of 2001, Todd Krasovetz was first commissioned by the Command at the Naval Hospital, Camp Pendleton where the 9′ x 8 ‘ foot oil painting titled wings of hope now hang. Wings of Hope military art painting series proudly commemorates the sacrifices of all of those who serve throughout all branches of the armed forces worldwide. CAMP PENDLETON —– For Todd Krasovetz, doing a painting of a Navy corpsman helping a wounded Marine had special meaning because his own brother is a corpsman. Since last month’s terrorist attacks on the World Trade Center and Pentagon, the painting has taken on even more meaning. October 07, 2004 Bridgeport Clinic Dedication ,BRIDGEPORT, Calif. Medal Of Honor Sailors, Marines, civilians and veterans of foreign wars gathered at Naval Hospital Branch Medical Clinic Bridgeport the morning of Oct. 1 for the solemn ceremony of dedicating the clinic for Hospitalman Richard D. De Wert, a Navy hospital corpsman who received the Medal of Honor for his selfless actions in combat. De Wert was assigned to D Company, 7th Marines, 1st Marine Division during the Korean War. I was commissioned by the command to produce a portrait of Hospitalman Richard D. De Wert for the clinic whic was renamed in honor of his legacy. As a working professional, Artist Todd Krasovetz has been producing gallery quality fine art of over 15 years. He has been commissioned numerious times by all branches of the armed forces, including the Army, Navy Air Force, Marines and many more government and state entities. His work is know as “Wings of Hope” painting and print series is extremly popular and is widely recognized throughout the military community. His work depicts spiritual elements like angel wings on many of the subjects he paints. 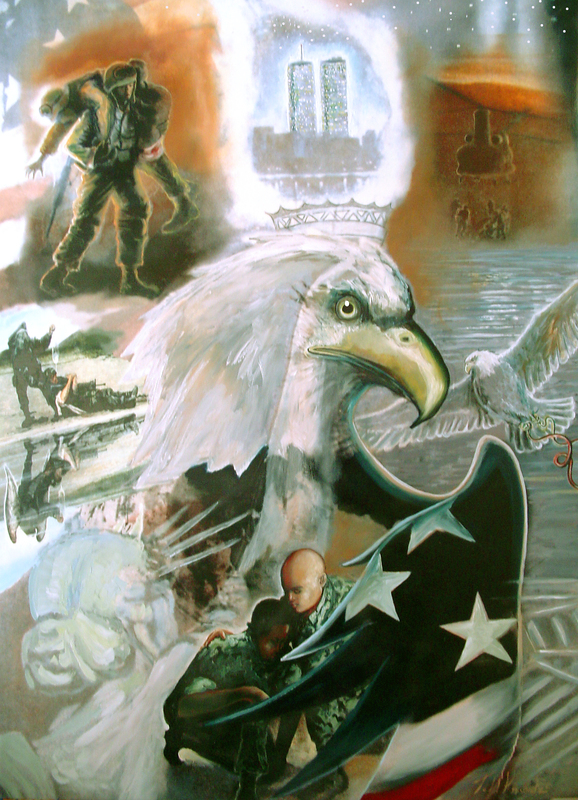 Wings OF Hope is the name of the first original oil painting in a series of military art paintings commissioned by the Marine Corps and the Command at the Naval Hospital Camp Pendleton, CA . At present there are a total of 4 paintings that now hang on permanent display at various Marine and Navy bases throughout the US but most can be found in southern California. These art paintings have become very popular within both the military, there families and the general population. In July of 2001, I was first commissioned by the Command at the Naval Hospital, Camp Pendleton where the 9′ x 8 ‘ foot oil painting titled wings of hope now hang. Wings of Hope military art painting series proudly commemorates the sacrifices of all of those who serve throughout all branches of the armed forces worldwide. We offer a special 20% discount on all products of $299 or more for all active duty military!! www.Official-Military-art.com values each customer and understands that military art, military artwork and military print product sometimes may be delivered damaged or not to original order specifications. In the event that your merchandise is damaged, we will sent you out new product once the damaged/unwanted goods are sent back to us for inspection. All return damaged merchandise shipping and packaging costs are the responsibility of the customer. In certain but rare situations we do offer refunds. This does not happen very often at all, as we pride ourselves in ensuring that the customer is completely satisfied. All shipping costs are included with the total purchase price and is added to the price upon checkout. We offer UPS 2-3 day, FedEx Priority 3-5 day, FedEx and Ups Ground 5-7 day. For 2 day and overnight delivery, There is a $20.00-75.00 extra charge for packaging and shipping depending on product weight and shipping destination. All shipping costs are included with the total purchase price and is added to the price upon checkout. We offer UPS 2-3 day, FedEx Priority 3-5 day, FedEx and Ups Ground 5-7 day. For 2 day and overnight delivery, There is a $20.00-75.00 extra charge for packaging and shipping depending on product weight and shipping destination. All orders are sent to the customer with a tracking and product ID number. All customers will be called in person to authenticate and validate your online order.